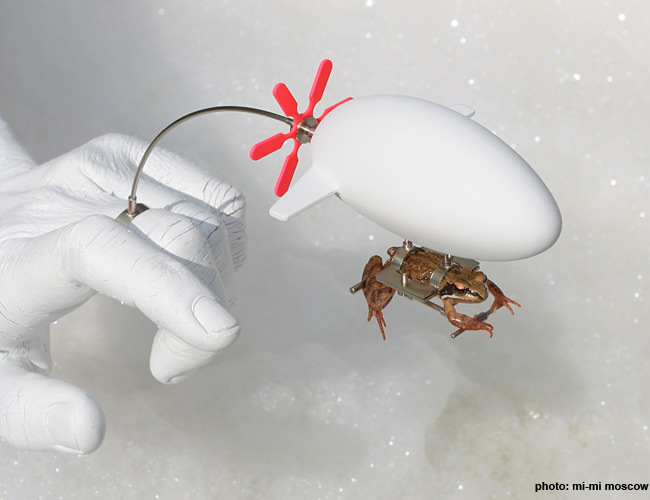 Two artists from Moscow are obsessed with an idea that a frog should fly too, so they make different photos of the frog in a “flight”, giving a name for each of them. “Siberian postman”, one more time. Where have you been Zafarad? Don’t be a stranger! Come back to this site more often!!! You’re comments are always pretty funny and it is good to have a real Russian on here. Very strange but fascinating art. Jewelry actually, and excellent workmanship . Hopefully the frog was set free after the photos were taken. Just don’t call them artists or others will berate you. No problem. I am used to it. but the “artist” is victim of a overdose of cocaine or a overdose of vodka? What i am saying.you are 100%right sir.poor frogs are too living things.why so caled damn `artists` try thees frankenstein experiments on their own. 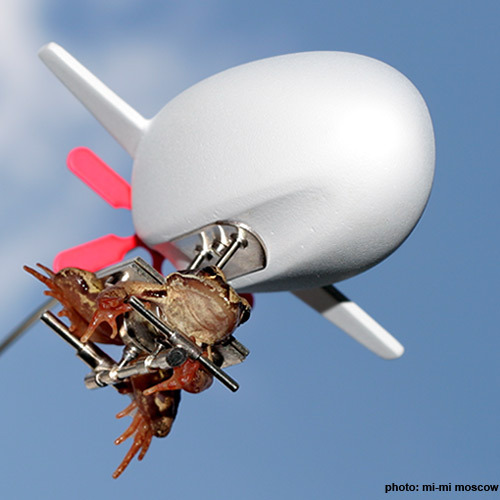 The frog doesn’t seem really happy to fly. Yes it does seem quite cruel. How are you feeling now? It does seem rather cruel. But since when was art about ethics or morality? The frog looks clearly depressed and annoyed. Oh well, at least Russia has frogs. In my region, they’ve mostly disappeared in the last 30 years. I used to see tree frogs every summer. Haven’t seen or hear one in 15 years. I wonder how much they sell the whole set for. 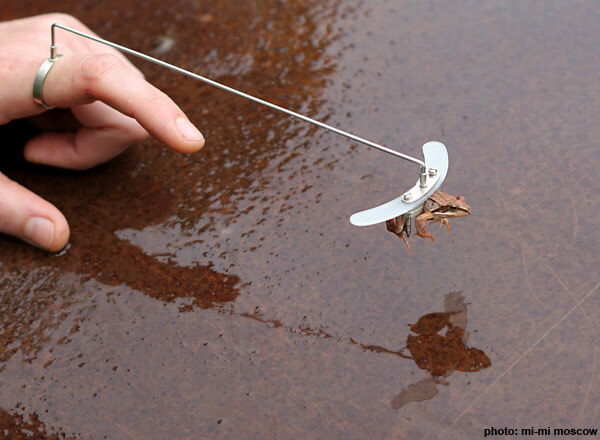 This looks harmless to the frogs, they are not impaled on small spikes, it’s a simple collar holding them in. Really interesting art. These days original ideas are few and far between, but this looks 100% original. I see myself in the mirror, but I can only see you at the Special Olympics. By the way, did you get first place in the long jump or in the asshat competition? I hear the trophies are nice. these are clearly photoshop jobs. You need not worry of cruelty. Zafarad, you must come back to this site! You comments are great!!!!! It may seem little cruel, but I think there are much more cruel things done to animals by the mankind. What ‘s your point ? That has already been done before, Artists have already shoved everything they could in their asses. Is this more cruel that putting a collar on a dog? How many vegetarians are here? Yes, it is. For many dogs, the collar is a symbol of “I get to go out and play” time. 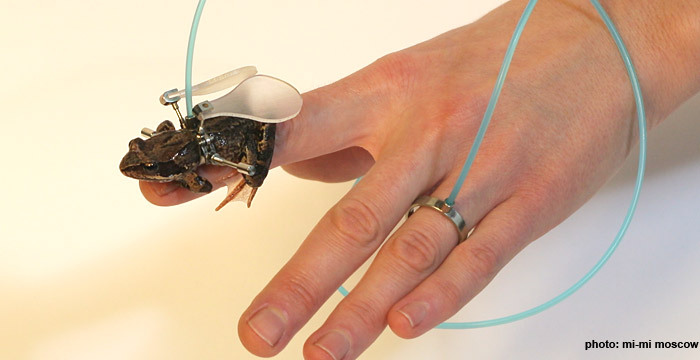 Frogs have extremely sensitive skin. Sensitive to pollutants, metals, oils on your hand. Just look at it’s face in pic 5. It hates it! They’re amphibians for christs sake! They are also sensitive to fish hooks through the lower jaw. But tell me something. How is it that you can read a frogs facial expression? You are mixing two different things together.apple with banana.did you see any pet frog with clamps and screws?did you ever listen someone clamped his pet,just for entertainment?vegetarian or nonveg,is not the issue.issue is that what do you think about the someones cruel and barbaric behaviour to the living creatures…How many stone hearted guys here??????????? So what is better for the frog, collared for a few minutes for a photo, eaten by a pike, or deep fried in hot grease for human cosumption? the pike since it happens fast and the pike gets food. 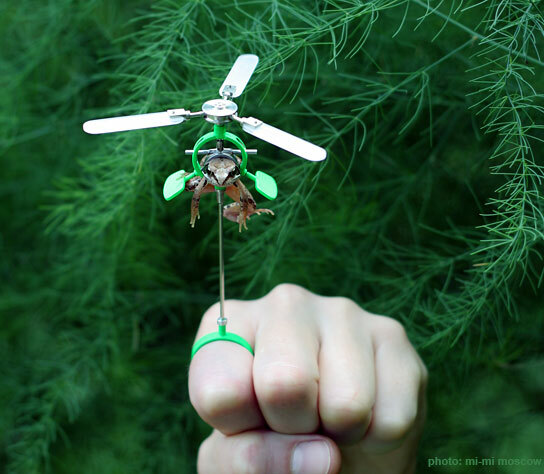 In Modern Russia, you fly frog. 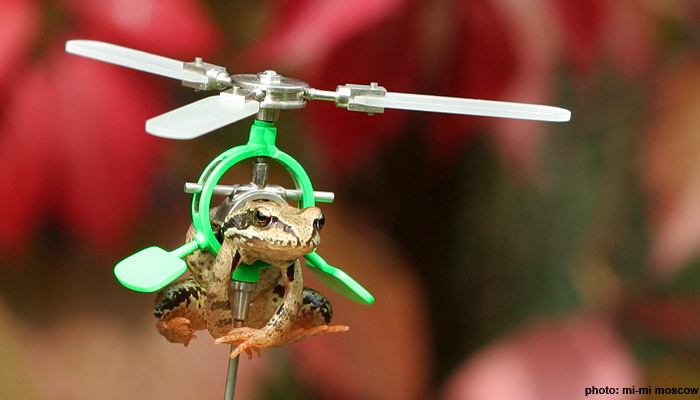 In Soviet Russia, frog flies you! Who’s talking about Americans here ? What do they have to do with it ? Are they a standard against which everything is checked ? It is very simple. Don’t do to others what you don’t want tot happen to you. If everybody would stick to that, the world would be a very different place. I adored the creativity. 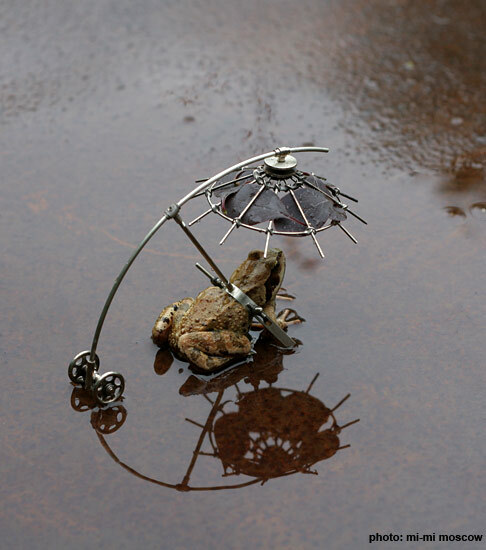 The frogs are fine – folks need to lighten up. If this was as brutal as the world ever got, it’d be a waaaay better place. 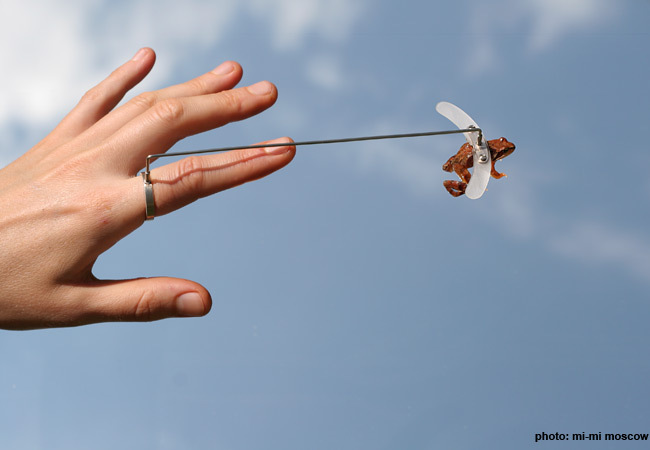 I’m a big fan of this blog, but this post is disgusting, poor frog. Free the frog!!! I don’t know why they call the frog’s name “Confucius” @[email protected]? lummy … it’s very beautiful provocation!!!! Can someone in Russia please tell me the name of the plant in the Eddy Chlorophyll photo? Could someone in Russia please identify the plant in the Eddy Chlorophyll photo? poor froggies, they are clearly uncomfortable. This is equivalent to torture, I would rather be dead than have to be in contraptions such as those. Really? I’d rather be stuck in a harness of plastic and metal for an hour than die. You must not have much to live for if you’re that willing to die. 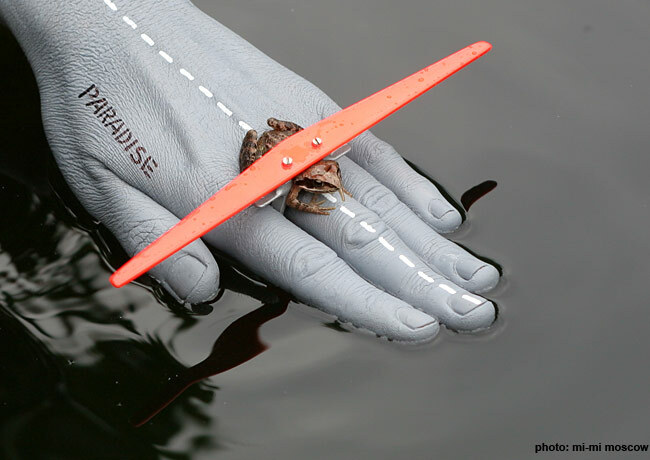 It seems frogs do not like to fly. Good blog post, this is very similar to a site that I have. Please check it out sometime and feel free to leave me a comenet on it and tell me what you think. Im always looking for feedback.